Face of the Astronomical Clock, in Old Town Square, Prague. An astronomical clock, horologium, or orloj is a clock with special mechanisms and dials to display astronomical information, such as the relative positions of the sun, moon, zodiacal constellations, and sometimes major planets. The astrarium made by the Italian astronomer and physician Giovanni Dondi dell'Orologio showed hour, year calendar, movement of the planets, Sun and Moon. Reconstruction, Museo nazionale della scienza e della tecnologia Leonardo da Vinci, Milan. The term is loosely used to refer to any clock that shows, in addition to the time of day, astronomical information. This could include the location of the sun and moon in the sky, the age and Lunar phases, the position of the sun on the ecliptic and the current zodiac sign, the sidereal time, and other astronomical data such as the moon's nodes (for indicating eclipses) or a rotating star map. The term should not be confused with astronomical regulator, a high precision but otherwise ordinary pendulum clock used in observatories. Astronomical clocks usually represent the solar system using the geocentric model. The center of the dial is often marked with a disc or sphere representing the earth, located at the center of the solar system. The sun is often represented by a golden sphere (as it initially appeared in the Antikythera Mechanism, back in the 2nd century BC), shown rotating around the earth once a day around a 24-hour analog dial. This view accorded both with the daily experience and with the philosophical world view of pre-Copernican Europe. Richard of Wallingford is shown measuring with a pair of compasses in this 14th-century miniature. British Library, London. Research in 2011 and 2012 led an expert group of researchers to posit that European astronomical clocks are descended from the technology of the Antikythera mechanism. In the 11th century, the Song dynasty Chinese horologist, mechanical engineer, and astronomer Su Song created a water-driven astronomical clock for his clock-tower of Kaifeng City. Su Song is noted for having incorporated an escapement mechanism and earliest known endless power-transmitting chain drive for his clock-tower and armillary sphere to function. Contemporary Muslim astronomers and engineers also constructed a variety of highly accurate astronomical clocks for use in their observatories,[verification needed] such as the castle clock (a water-powered astronomical clock) by Al-Jazari in 1206, and the astrolabic clock by Ibn al-Shatir in the early 14th century. The astronomical clocks developed by the English mathematician and cleric Richard of Wallingford in St Albans during the 1330s, and by medieval Italian physician and astronomer Giovanni de Dondi in Padua between 1348 and 1364 are masterpieces of their type. They no longer exist, but detailed descriptions of their design and construction survive, and modern reproductions have been made. Wallingford's clock may have shown the sun, moon (age, phase, and node), stars and planets, and had, in addition, a wheel of fortune and an indicator of the state of the tide at London Bridge. De Dondi's clock was a seven-faced construction with 107 moving parts, showing the positions of the sun, moon, and five planets, as well as religious feast days. Le Gros Horloge in Rouen is one of the earliest known astronomical clocks. The clock is installed in a Renaissance arch crossing the Rue du Gros-Horloge. The mechanism is one of the oldest in France; the movement was made in 1389. Construction of the clock was started by Jourdain del Leche, who lacked the necessary expertise to finish the task, so the work was completed by Jean de Felain, who became the first to hold the position of governor of the clock. The clock was originally constructed without a dial, with one revolution of the hour-hand representing twenty-four hours. The movement is cast in wrought iron, and at approximately twice the size of the Wells Cathedral clock, it is perhaps the largest such mechanism still extant. A facade was added in 1529 when the clock was moved to its current position. The Renaissance facade represents a golden sun with 24 rays on a starry blue background. The dial measures 2.5 metres in diameter. The phases of the moon are shown in the oculus of the upper part of the dial. It completes a full rotation in 29 days. The week days are shown in an opening at the base of the dial with allegorical subjects for each day of the week. The Science Museum (London) has a scale model of the 'Cosmic Engine', which Su Sung, a Chinese polymath, designed and constructed in China in 1092. This great astronomical hydromechanical clock tower was about ten metres high (about 30 feet) and featured a clock escapement and was indirectly powered by rotating wheel either with falling water and liquid mercury, which freezes at a much lower temperature than water, allowing operation of the clock during colder weather. A full-sized working replica of Su Sung's clock exists in the Republic of China (Taiwan)'s National Museum of Natural Science, Taichung city. This full-scale, fully functional replica, approximately 12 meters (39 feet) in height, was constructed from Su Sung's original descriptions and mechanical drawings. The most sophisticated water-powered astronomical clock was Al-Jazari's castle clock, considered to be an early example of a programmable analog computer, in 1206. It was a complex device that was about 33 meters (108 feet) high, and had multiple functions alongside timekeeping. It included a display of the zodiac and the solar and lunar orbits, and a pointer in the shape of the crescent moon which travelled across the top of a gateway, moved by a hidden cart and causing automatic doors to open, each revealing a mannequin, every hour. It was possible to re-program the length of day and night every day in order to account for the changing lengths of day and night throughout the year, and it also featured five musician automata who automatically played music when moved by levers operated by a hidden camshaft attached to a water wheel. Other components of the castle clock included a main reservoir with a float, a float chamber and flow regulator, plate and valve trough, two pulleys, crescent disc displaying the zodiac, and two falcon automata dropping balls into vases. The Strasbourg Cathedral has housed three different astronomical clocks since the 14th century. The first clock was built between 1352 and 1354 and stopped working sometime at the beginning of the 16th century. A second clock was then built by Herlin, Conrad Dasypodius, the Habrecht brothers, and others, between 1547 and 1574. This clock stopped working in 1788 or 1789 (as it apparently stopped working gradually, each component being disconnected one after the other). After a lapse of 50 years, a new clock was built by Jean-Baptiste Schwilgué (1776–1856) and about 30 workers. This clock is housed in the case of the 2nd clock. It shows many astronomical and calendrical functions (including what is thought to be the first complete mechanization of the part of the computus needed to compute Easter) as well as several automata. One of the most famous of this type of clock is the Old-Town Hall clock in Prague, Czech Republic. 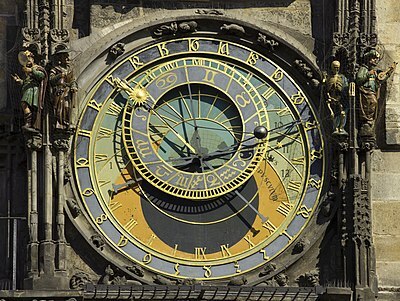 It is also known as the Prague orloj. The central portion was completed in 1410. The four figures are set in motion at the hour, with Death (represented by a skeleton) striking the time. On the hour there is a presentation of statues of the Apostles at the doorways above the clock, with all twelve presented at noon. In 1490 a calendar display was added below the clock along with decorative Gothic sculptures. During World War II the clock was nearly destroyed by Nazi fire. The townspeople are credited with heroic efforts in saving most of the parts. It was gradually renovated until 1948. In 1979 the clock was once more cleaned and renovated. According to local legend the city will suffer if the clock is neglected and its good operation is placed in jeopardy. Olomouc, the former capital of Moravia in the eastern part of the Czech Republic, also has an impressive exterior astronomical clock on the main town square. It is a rare example of a heliocentric astronomical clock. A legend dates its construction to the year 1422; however, in historic sources it is first mentioned in 1517. The clock was remodelled approximately once every century; in 1898 the astrolabe was replaced with a heliocentric model of the solar system. When the retreating Nazi German army passed through Olomouc in the final days of the war in May 1945, they opened fire on the old astronomical clock, leaving only a few pieces (that can now be seen in the local museum). As a result of the serious damage the clock was reconstructed in the style of socialist-realism in the first years of communist rule in Czechoslovakia (1948-early 1950s). The religious and royal figures were replaced with athletes, workers, farmers, scientists and other members of the proletariat, while the glockenspiel was altered to play three pieces of traditional local music. In 2009 an astronomical clock was built in the municipality of Stará Bystrica in Northern Slovakia during the reconstruction of the town square. The astronomical clock has the shape of a stylized form of Our Lady of Sorrows, patron of Slovakia; it has been described as the largest wooden statue of Slovakia. Its exterior is decorated by statues of important figures from Slovakia's history: Prince Pribina, King Svatopluk, Anton Bernolák, Ľudovít Štúr, Milan Rastislav Štefánik, Andrej Hlinka. Each hour, statuettes of saints connected with Slovakia appear: Cyril, Methodius, Andrew-Zorard, Benedict, Gorazd, Bystrík and Adalbert. The bells of the clock carry the names Sv. Juraj (St. George) and Riečnická Madona (Our Lady of Riečnica); the first is rung to indicate the time, the second accompanies the saints. This astronomical clock is the only one in Slovakia. The astronomical part of the clock consists of an astrolabe displaying the astrological signs, positions of the Sun and Moon, and the lunar phases. The clock is controlled by computer using DCF77 signals. The astronomical clock in Lund Cathedral in Sweden, Horologium mirabile Lundense was made around 1425, probably by the clockmaker Nicolaus Lilienveld in Rostock. After it had been in storage since 1837, it was restored and put back in place in 1923. Only the upper, astronomical part is original, while some of the other remaining medieval parts can be seen at the Cathedral museum. When it plays, one can hear In Dulci Jubilo from the smallest organ in the church, while seven wooden figures, representing the three magi and their servants, pass by. Made in 1860 by Auguste-Lucien Vérité [fr] of Beauvais, the astronomical clock in Besançon expresses the theological concept that during each second of the day the Resurrection of Christ transforms the existence of man and of the world. The clock stands 5.8 metres high and 2.5 metres wide, and has 30,000 mechanical parts. Seventy dials provide 122 indications including seconds, hours, days and years. The clock is perpetual and can register up to 10,000 years, including adjustments for leap year cycles. Immediately after he finished the Besançon commission, Vérité built a larger more elaborate clock for Beauvais Cathedral in his home town. Beauvais astronomical clock in Beauvais Cathedral was built by Auguste-Lucien Vérité over a period of four years, from 1865 to 1868 as a follow-up to his elaborate clock at Besancon. It is 12 metres high, 6 metres wide, and contains over 90,000 individual parts. It has 52 dials that display the times of sunrise, sunset, moonrise, moonset, the phases of the moon, the solstices, the position of the planets, the current time in 18 cities around the world, and the tidal hours. The clock has a case that blends Romanesque and Byzantine styles and is crowned by a multi-tiered Celestial City with 68 automata that animate, at the striking of each hour, to enact the Last Judgement. The city hall in Copenhagen has a complete astronomical clock, set in an interior glass cabinet. The clock was designed over a period of 50 years by amateur astronomer and professional clockmaker Jens Olsen. Some of the components (such as the computus) were inspired by the Strasbourg clock, which was studied by Olsen. It was assembled from 1948 to 1955. Between 1995 and 1997 the clock underwent a complete restoration by the Danish watchmaker and conservator Søren Andersen. Arguably the most complicated of its kind ever constructed, the last of a total of four astronomical clocks designed and made by Norwegian Rasmus Sørnes (1893–1967), is characterized by its superior complexity compactly housed in a casing with the modest measurements of 0.70 x 0.60 x 2.10 m. Features include locations of the sun and moon in the zodiac, Julian calendar, Gregorian calendar, sidereal time, GMT, local time with daylight saving time and leap year, solar and lunar cycle corrections, eclipses, local sunset and sunrise, moonphase, tides, sunspot cycles and a planetarium including Pluto's 248-year orbit and the 25 800-year period of the polar ecliptics (precession of the Earth's axis). All wheels are in brass and gold-plated. Dials are silver-plated. Sørnes also made the necessary tools and based his work on his own observations of the firmament. This remarkable timepiece will probably be the last one ever to be designed and made by hand by one single person as true craftsmanship and a work of art. The result, outstanding for its performance and accuracy, remains a symbol of the transition from the mechanical age, Sørnes' electromechanical pendulum system pointing forward into the age of digital clocks. Having been exhibited at the Time Museum in Rockford, Illinois, and at The Chicago Museum of Science and Industry, the clock was sold in 2002 and its current location is not known. The Rasmus Sørnes Astronomical Clock no.3, the precursor to the Chicago Clock, his tools, patents, drawings, telescope and other items, are exhibited at the Borgarsyssel Museum in Sarpsborg, Norway. There are many examples of astronomical table clocks, due to their popularity as showpieces. To become a master clockmaker in 17th-century Augsburg, candidates had to design and build a 'masterpiece' clock, an astronomical table-top clock of formidable complexity. Examples can be found in museums, such as London's British Museum. In Japan, Tanaka Hisashige made a Myriad year clock in 1851. More recently, independent clockmaker Christiaan van der Klaauw [nl] created a wristwatch astrolabe, the "Astrolabium" in addition to the "Planetarium 2000", the "Eclipse 2001" and the "Real Moon." Ulysse Nardin also sells several astronomical wristwatches, the "Astrolabium," "Planetarium", and the "Tellurium J. Kepler." Part of the Gdańsk astronomical clock in St Mary's Church, Gdańsk, Poland. Haguenau. The Renaissance building of the former chancellery (now housing the Musée alsacien) displays an astronomical clock on its facade. Lyon. The Lyon astronomical clock in Lyon Cathedral also has an astronomical clock from the 14th century. Rouen. The Gros Horloge is a famous astronomical clock with a movement dating back to the 14th century, though the facade is more recent. It is located in the Gros Horloge street. Versailles. The Passemant astronomical clock in the Palace of Versailles near Paris is a rococo astronomical clock sitting on a formal low marble base. It took 12 years for a clockmaker and an engineer to build and was presented to Louis XV in 1754. Esslingen am Neckar. At the headquarters of Festo, Professor Hans Scheurenbrand has constructed the Harmonices Mundi (named after Kepler's book of the same name), which consists of a technologically sophisticated astronomical clock, a world time clock, and a 74 bell glockenspiel. Esslingen am Neckar. Old town hall. Münster. St. Paul's Cathedral, includes an astronomical clock of 1540, adorned with hand-painted zodiac symbols, which traces the movement of the planets, and plays a Glockenspiel tune every noon. Rostock. The Rostock astronomical clock in St. Mary's Church dating from 1472, built by Hans Düringer. Clock with daily time, zodiac, moon phases, and month. Calendar, which is valid until 2017. Mdina. The astronomical clock is divided into two different quadrants in two towers of St. Paul's Cathedral. Valletta. The astronomical clock of Grandmaster's Palace (tower of the courtyard). Valletta. The astronomical clock of the "Yellow Room" in Grandmaster's Palace, this clock was made by André Charles Boulle (17th Century). Valletta. The astronomical clock of St. John's Co-Cathedral. Cremona. The Torrazzo, the bell tower of the Cremona Cathedral, contains the largest medieval clock in Europe. Mantua. The Palazzo della Ragione with the "Tower of the Clock"
Messina. The Orologio astronomico di Messina. Multi-dial clock equipped with some of the most complex automata. Reconstructed between 1930 and 1933 by the Ungerer Company of Strasbourg, on the base of an original dating from 1574. It is one of the largest astronomical clocks in the world. Padova. Clock by Jacopo Dondi dating 1344. Trapani. The Orologio astronomico di Trapani (1570 and restored in 1596). Venice. St Mark's Clock, in the clocktower on St Mark's Square, was built and installed by Gian Paulo and Gian Carlo Rainieri, father and son, between 1496 and 1499. Gdańsk. In St. Mary's Church there is the Gdańsk astronomical clock dating from 1464 to 1470, and built by Hans Düringer of Toruń. It was reconstructed after 1945. Bern. The Zytglogge is a famous astronomical clock from the 15th century situated in the landmark medieval tower of the same name. Exeter. The Exeter Cathedral astronomical clock is one of the group of famous 14th to 16th century astronomical clocks to be found in the West of England. The main, lower, dial is the oldest part of the clock, probably dating from the 1480s. Hampton Court Palace. The Hampton Court astronomical clock is on the interior façade of the Main Gatehouse. It is a fine early example of a pre-Copernican astronomical clock. Leicester. The Leicester University astronomical clock is on the Rattray Lecture Theatre opposite the Physics department. St Albans. A modern clock dating from 1995 built from notes by Richard of Wallingford held in the Bodleian Library, Oxford. On display in St Albans Cathedral. Wells. The Wells Cathedral clock is an astronomical clock in the north transept of Wells Cathedral, England. It can be dated to between 1386 and 1392. York. The York Minster astronomical clock, although modern, is a prime example of an astronomical clock, and was built to commemorate the RAF and Commonwealth nations' efforts in World War II. How the 24-hour analog dial might be interpreted. Diagram showing how the zodiac is projected on to the ecliptic dial – the symbols are often drawn inside the dial. Stereographic projection from the North pole. Most astronomical clocks have a 24-hour analog dial around the outside edge, numbered from I to XII then from I to XII again. The current time is indicated by a golden ball or a picture of the sun at the end of a pointer. Local noon is usually at the top of the dial, and midnight at the bottom. Minute hands are rarely used. If XII is not at the top of the dial, or if the numbers are Arabic rather than Roman, then the time may be shown in Italian hours (also called Bohemian, or Old Czech, hours). In this system, 1 o'clock occurs at sunset, and counting continues through the night and into the next afternoon, reaching 24 an hour before sunset. The year is usually represented by the 12 signs of the zodiac, arranged either as a concentric circle inside the 24-hour dial, or drawn onto a displaced smaller circle, which is a projection of the ecliptic, the path of the sun and planets through the sky, and the plane of the Earth's orbit. To find the date, find the place where the hour hand or sun disk intersects the ecliptic dial: this indicates the current star sign, the sun's current location on the ecliptic. The intersection point slowly moves round the ecliptic dial during the year, as the sun moves out of one astrological sign into another. In the diagram showing the clock face on the right, the sun's disk has recently moved into Aries (the stylized ram's horns), having left Pisces. The date is therefore late March or early April. Unequal hours were the result of dividing up the period of daylight into 12 equal hours, and night time into another 12. In Europe, there is more daylight in the summer, and less night, so each of the 12 daylight hours is longer than a night hour. Similarly in winter, daylight hours are shorter, and night hours are longer. These unequal hours are shown by the curved lines radiating from the center. The longer daylight hours in summer can usually be seen at the outer edge of the dial, and the time in unequal hours is read by noting the intersection of the sun hand with the appropriate curved line. Astrologers placed importance on how the sun, moon, and planets were arranged and aligned in the sky. If certain planets appeared at the points of a triangle, hexagon, or square, or if they were opposite or next to each other, the appropriate aspect was used to determine the event's significance. On some clocks you can see the common aspects—triangle, square, and hexagon—drawn inside the central disk, with each line marked by the symbol for that aspect, and you may also see the signs for conjunction and opposition. On an astrolabe, the corners of the different aspects could be lined up on any of the planets. On a clock, though, the disk containing the aspect lines can't be rotated at will, so they usually show only the aspects of the sun or moon. The moon's orbit is not in the same plane as the Earth's orbit around the sun, but crosses it in two places. The moon crosses the ecliptic plane twice a month, once when it goes up above the plane, and again 15 or so days later when it goes back down below the ecliptic. These two locations are the ascending and descending lunar nodes. Solar and lunar eclipses will occur only when the moon is positioned near one of these nodes, because at other times the moon is either too high or too low for an eclipse to be noticed from earth. Some astronomical clocks keep track of the position of the lunar nodes with a long pointer that crosses the dial. This so-called dragon hand makes one complete rotation around the ecliptic dial every 19 years. When the dragon hand and the new moon coincide, the moon is on the same plane as the earth and sun, and so there is every chance that an eclipse will be visible from somewhere on earth. ^ PBS (2013). NOVA: "Ancient Computer". Retrieved 4 April 2013. ^ Dr. Kasem Ajram (1992). Miracle of Islamic Science, Appendix B. Knowledge House Publishers. ISBN 0-911119-43-4. ^ David A. King (1983). "The Astronomy of the Mamluks", Isis 74 (4), p. 531-555 [545–546]. ^ Whyte, Nicholas. "The Astronomical Clock of Richard of Wallingford". personal website. Archived from the original on 4 May 2008. Retrieved 24 April 2008. ^ a b Burnett-Stuart, George. "De Dondi's Astrarium". Almagest. Computastat Group Ltd. Archived from the original on 30 May 2008. Retrieved 21 April 2008. ^ Tanguy, Jacques (2006). "Le Gros-Horloge"
^ a b Dragicevich, Peter (2010). Brittany and Normandy. Lonely Planet. p. 238. ISBN 9781741042382. ^ "National Museum of Natural Science -> Exhibition -> Permanent Exhibits". nmns.edu.tw. ^ Howard R. Turner (1997), Science in Medieval Islam: An Illustrated Introduction, p. 184. University of Texas Press, ISBN 0-292-78149-0. ^ "A History of Engineering in Classical and Medieval Times". google.com.my. ^ "Time to Celebrate". google.com.my. ^ "Ancient Discoveries, Episode 11: Ancient Robots". History Channel. Retrieved 6 September 2008. ^ "Mughal and other Indian paintings from the Chester Beatty Library". google.com.my. ^ Ahmad Y al-Hassan & Donald R. Hill (1986), Islamic Technology, Cambridge, ISBN 0-521-42239-6, p. 59. ^ "Festo > Pneumatic & Electric Automation Worldwide – Cylinder, Actuator, Drive, Valve, Sensor and Compressed Air Supply". festo.com. ^ "Stock Photos, Royalty-Free Images and Vectors". shutterstock.com. ^ Burnett-Stuart, George. "Astronomical Clocks of the Middle Ages: A guided tour". Almagest. Computastat Group, Ltd. Archived from the original on 2 April 2008. Retrieved 24 April 2008. Burnett-Stuart, George. "Astronomical Clocks of the Middle Ages: A guided tour". Almagest. Computastat Group, Ltd. Archived from the original on 2 April 2008. Retrieved 24 April 2008.